‘Scandalizing is celebrated openly today. We’ll manipulate and defame so all will pretty much see our enemies as disgraceful or hypocritical. It makes me want to cry when I hear of this intimidation inside the Church. Jesus told us that this would really, truly happen. We shouldn’t be at all disturbed. To be hurt this way is very much part of being his disciple. Offended. The word in our Greek N.T. is “skandalon.” It’s used in many ways, but the most amazing one is defined as, “the trigger of a trap, to kill an animal. To be the trap wire or stick used to catch prey; a snare.” We have the word scandalous, or to be involved in a vicious manipulation, scandal. Another metaphor is that it’s like the “fly paper” that’s hung up in the barn to catch those big nasty flies. Jesus dug up his dictionary, and chose this very specific word to communicate what he wanted. Of men and women, boys and girls caught in something they can’t get out of without help. John the Baptist, languishing in a dark place, wants to understand Jesus. John seems to expect Jesus to hop on a white stallion, and forcefully exert his messianic role. Jesus will send his message. “You’re blessed indeed, if you do not stumble” (or get trapped) by the misconceptions. John confined in Herod’s dungeon, would be meticulously praised by Jesus. The Lord honors his own openly. It is easy to take up offense, (whether right or wrong.) 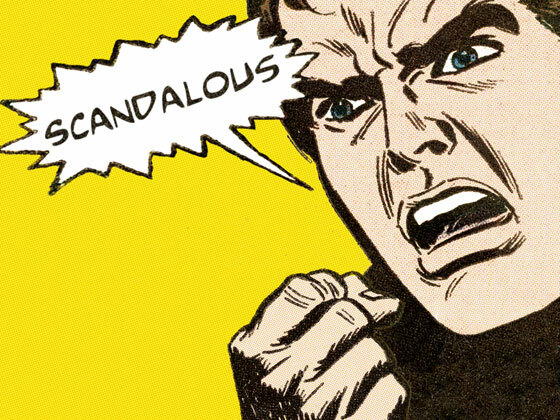 When we hear a message causing shock, anger, repulsion, or disgust; that is a pretty good indicator that you are being “scandalized.” And turn-around is fair play. We might be the scandalizer, or the victim. It happens all the time. Are you trapping– or are you trapped? Either way we need to stop it. We can’t continue to trip others up– nor can we allow others to foist their trap on us either. The Gospel regards itself as a ‘stumbling block. For some agnostics’, Jesus is someone they keep tripping over. But for the believer, Jesus is a ‘climbing up’ stone! They become graceless and sterile in the important matters of the heart. They become rigid and bitter. The man or woman who stands up for their faith, and who doesn’t fall away or let their zeal ‘leak away,’ is incredibly blessed. God however is ready to forgive all those who backslide and then repent, but is especially pleased with those– like John, who hold firm to the faith.